I never really gave enough chance to the 90s decade of Rock and Metal. It is not that I didn’t want to listen to any musical piece, on the contrary. Nonetheless, it didn’t seem to get to me as much as the 80s did. Yeah, I know, different times, different tastes, different fans. However, new reasons to notice that glass half-full glass exist may come around knocking, banging hard on the door, demanding to be taken into account before going overboard with passed verdict. Recently I found out about the Australian Metal band 29 BONES, hailing from Melbourne. Like any new discovery, the crossed my ears, however, provided me enough reasons to take a breather and get back to them later. Two years after their formation, the Aussies independently released “Electric Killers”, clocking two decades of Metal and Rock, slowly evolving into a party that is a must go. Though usually I like bands that are more or less decided of how they are going to play this, what can you say a traditionalist, “Electric Killers” shows the opposite. With that written, there is no doubt about it, there is a guideline leading the pack, and you can forget about calling it progressive. Nonetheless, the sheer swiftness between American oriented Metal of the early 90s (METALLICA / ARMORED SAINT / OZZY OSBOURNE / ANTHRAX) and rapid fire of Grunge / Heavy Rock (ALICE IN CHAINS / SOUNDGARDEN) gushing with a massively charged groove while also side showing 70s oriented Hammond type keyboards, is nothing less than a treat. Being heavy as they come, without letting melody slip away, and in the same breath mashing simplistic and catchy songwriting, largely did the trick for this album. 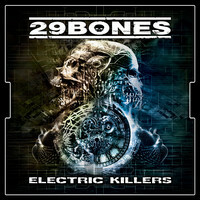 29 BONES doesn’t sound like a band that has been overextending itself, just making it plain honest Metal and Rock fusion, right up in the spine. Before I approached this record in full, I explored the self-titled tune, “Electric Killers”, over in YouTube, as it was released as a lead single. Wise choice by the way, it really nailed it. Right from the get go, the song, and album’s, smooth production quality took me in for a ride and boy it sounds grand. The song itself is a pack load of soaring groove and heaviness, a true headbanger. “Dead Man's Crown”’s intro and main riff didn’t leave any room for surprise, this would be one of the album’ powerhouses. Brock and Dianne stellar combination in the chorus, made a smile on my face. Other than the mix that made it a match in heaven, the vocal qualities of Brock are sonically delivered. “Right Now”’s semi-Thrash Metal tone, a little on and off late 80s feel, manifested the addiction for the simple things in Metal riffs, straightforwardness that is tight and fluent without holding anything off. “Day by Day” is a sort of combination of what this album has to offer. It happens in quite a lot of records actually. On the other hand, this song majorly emphasizes the band’s smart use of keyboards served well with groove kind of Thrash Metal, which is a booster and a factor to recognize. Starting out only a few years back, 29 BONES sound like a strong unit that has been in the zone for a lot more. “Electric Killers” is a great starting point and it would interesting to see what is next in line.